The California is debating raising its renewable energy target to 50% by 2030 from its current 33% by 2020 target, but the state is almost at that mark on an operational basis. Electricity generated by large hydroelectric projects do not count toward the state’s renewable portfolio standard, but from an operational standpoint that power is just as renewable, and just as vulnerable to the vagaries of Mother Nature, as are wind and solar power. The ongoing drought underscores that reality. 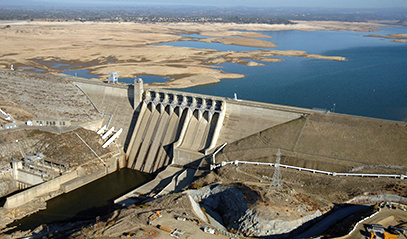 Hydroelectric power contributes anywhere from 9% to 15% of the electricity consumed in California in any given year, depending on hydrological conditions. Right now conditions are abysmal. Rainfall and reservoir levels are about 60% of average levels. Available hydroelectric resources, as measured by the California ISO, which operates the state’s wholesale power market, are the lowest they have been in 10 years. The ISO says hydro capacity to meet peak August demand is 7,428 MW. It was 8,180 MW in last year. Those hydro resources come from large dams, mostly in the northern part of the state, and, it is worth repeating, do not count toward meeting the 33% RPS target, but they do count toward keeping the lights on. In-state renewable resources accounted for 14% of all the electricity generated in California in 2014, the most recent numbers available from the California Energy Commission. If hydroelectric output is included, that number jumps to 20%. If out-of-state imports are included – in the summer California imports a significant amount of electric power from hydroelectric facilities in the Southwest and the Northwest – the state’s reliance on renewable resources is even higher. Non-coal imports accounted for 28% of California’s electricity consumption in 2014. Combined with in-state resources, that boosts renewable resource’s share of the state’s 2014 electricity consumption to 48%. On an operational basis, the state has not only exceeded its RPS target, it is nearly at the 50% target being debated in the legislature. And California’s operational dependence on renewable resources is going to go even higher. Every spring the ISO looks ahead and assesses summer conditions. For this summer, the ISO expects less hydro power will be available. The ISO projects that hydro derates for 2015 will be between 1,511 MW and 2,733 MW, depending on weather conditions. Its hydro derate projections for last summer were 1,370 MW to 1,669 MW. But the ISO also notes that new generation additions are prepared to take up the slack. Between June 1, 2014, and June 1, 2015, the agency expected 2,328 MW of new renewable generation to come online of which about 96% is solar power. That fresh slug of solar power will increase California’s reliance on renewable resources. And if the state does adopt a 50% RPS standard, expect even more renewable resources to be built in the state, pushing renewable share even higher. If that happens, and the state does eventually reach 50% renewable, its functional dependence on renewable resources (including large hydro) could get into the 80% to 90% range. This summer could serve as a stress test for an electric power system that derives nearly half its electricity from renewable resources. The state might pass, or it could be a wake-up call.